Best Self Co already has an amazing product — the Best Self Journal — that entrepreneurs and planner-lovers are obsessed with. 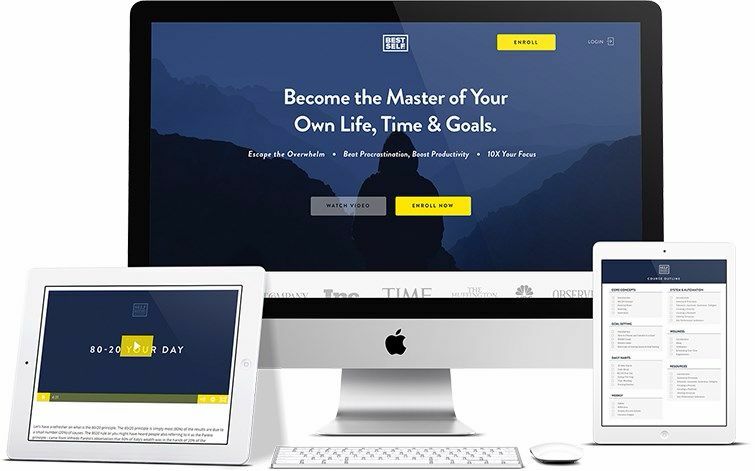 They designed the Self Mastery Academy to provide a more in-depth look at productivity and success. Whereas the journal is a physical tool, the Academy actually delves into the systems and habits that make (or break) a well-planned life & business. Because things like “productivity,” “success,” and “being your best self” are intangibles, their initial copy was having a hard time hitting home. They needed a powerful angle that would punch their readers right where it hurt (A.K.A. your life is a hurricane and you never make progress on the things that really matter). This was the first client I tried out my discovery process on, and because the subject matter was so hard to pin down, I ended up refining it a lot for future jobs. I gave them a few different hooks to play with at the top, and they had two rounds of revisions to get this where they wanted it. We turned this job around in less than 3 weeks.